Dailymail UK has an article posted today about King Henry VIII and written by our very own, Philippa Gregory. The 500th anniversary of his coronation is in June and there is a new exhibition at the Tower of London, opening in April. The exhibition will show suits of armour from Henry VIII...where it will be easy to see just how large he became towards the end of his reign. The exhibition, "Dressed to Kill" will open to the public on April 3 at the Tower of London. Click here to read the article. And if you are able to visit this exhibit please let us know how it was! Drat!!! I won't be able to get back across the pond until 2010. Sounds like a fabulous exhibit for us Tudor fans. What a fantastic exhibit. Just how is Showtime going to get that fantastic young Henry VIII to bulk up enough for the part. LOL.. Thanks for the Great post. That would be something to see for sure. Thanks for pointing this article out! I'm currently reading The Autobiography of Henry VIII by Margaret George (loving it, btw) so this is very a propos. I wish I go to this exhibit! 500 years! Wow! I wish I could go to the exhibit. I love London! I would love to see this exhibit. 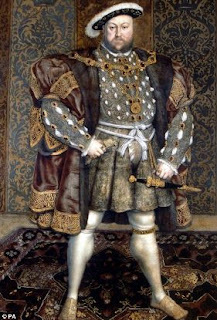 Anyway, I really like Henry VIII despite his cruel decisions. He did change the course of history for England after all. Wow, that would definitely be something to see. Wish I could! That would be so much fun to see! I've been to the tower and seen some of the displays, but would love to see what they are going to add that's "new." I know Henry the VIII is accurately portrayed in the Tudors, but Rhys-Meyers is so hot! A girl can dream can't she? All: Can you imagine how much money they would bank if they brought this exhibit over here?! How much fun would that be to all meet up there?! Julie: that is a fantastic novel...I've read it twice so far. By far one of the best novels to read if you want to really know Henry VIII. Jenny: Rhys is quite a stretch for Henry VIII...but who wants to watch a fat guy with leg sores rolling around in bed? !